There’s no mistaking Yandina's rural heritage – there’s a battered farm ute turning at the traffic lights towards Nambour and an agricultural machinery supplier in the main street. Yandina. Early morning. There’s no mistaking this town’s rural heritage – there’s a battered farm ute turning at the traffic lights towards Nambour and an agricultural machinery supplier in the main street. Most of the buildings along this central strip are separate dwellings – low-set single-storey properties that were probably once residential homes (in fact, some of them still are). In any direction, a 10-minute stroll will have you in the surrounding countryside. But the town is busy – there are tradesmen in hi-vis picking up a quick pie from the bakery or an early-morning coffee at one of the town’s cafes. Shops are opening their doors and locals are heading out to get on with their days. In so many ways Yandina is like any other of the region’s hinterland townships – like Cooroy and Pomona, Mooloolah Valley and Landsborough it’s still very much a small town, with a pub and a primary school, a hardware store and mechanics. Locals bump into each other as they grab some groceries after school drop-off or while they’re doing the banking at the post office. However, there’s something a little special about Yandina, and it’s not just the scent of ginger in the air. The Aboriginal people of the area belonged to the Gubbi Gubbi language group. And the name of Yandina honours those traditional owners – ‘yan’ means go and ‘dinna’ on foot. In terms of European settlement, Yandina is an old town. Its post office was established in 1868 and the town was surveyed in 1871 with blocks sold from 1873 onwards. Then called Maroochy, the settlement was the first commercial centre on the Sunshine Coast. In 1874 a telegraph office was opened and in the 1880s settlers started coming in earnest, clearing trees and establishing crops of cane, fruit and maize. Today, visitors can still find plenty of original buildings: the Anglican church, which opened as a community church in the 1880s, is the oldest on the Coast; the Yandina hotel dates back to 1889 and was relocated to its current position using rollers and a bullock team in 1891 when the owner realised he’d built it in the wrong spot; and there is Koongalba homestead, a privately owned heritage-listed property. 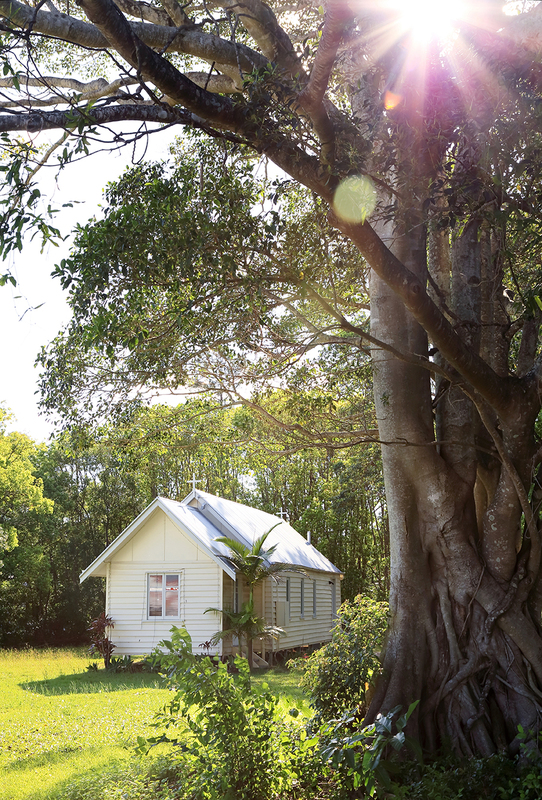 With its history and location, Yandina has been known as many things – a ginger town (thanks to The Ginger Factory), a timber town, historic town, river town and railway town. But what is Yandina today? If you ask Tanya Hoddinott from Stevens Street Gallery, no doubt she will tell you it’s a friendly town. Tanya is an artist who moved to Yandina more than a year ago. “The people are very warm and very welcoming,” she says. “I have lived in lots of country towns and I have never been embraced as I have in Yandina. The space she is talking about is her studio and gallery at 2 Stevens Street. She says her gallery and nearby shops draw people down the street. She’s seen other changes too. “A lot of shops have been filled, and with interesting things. You can come and have lunch, get a haircut, buy some art, look at some real estate and buy a beautiful dress. So along with ginger, railway and historic, I guess we can call Yandina a friendly, popular and creative town too.